Flaxseed is a standard replacement for eggs although EnerG Egg Replacer﻿ is also an excellent fit. In place of milk, some use water and I recommend almond milk since this is also easy to source and to help retain the yummy taste instead of making the cake taste bland by any degree. Still, on milk, organic rice milk is still an excellent choice in place of cow milk. Rice milk is available at the local grocery store if you bother to find out. For anyone talking about coke; I recommend orange juice instead. There are many options to explore when it comes to sugar with beet sugar coming tops on my recommendation. For anyone poised to avoid whitened sugar contaminated by bone char, unbleached sugar is readily available if you know it well enough to ask for it when shopping. To avoid using butter, margarine is readily available or asks for vegetable shortening in its place. Dairy frosting can be avoided by asking for non-dairy frosting. Outside of the replacement process outlined, the baking process remains essentially the same and your cake will come out as a perfect vegetarian delight. Chocolate is a treat everybody loves. And vegans can enjoy them too! There are ways to make vegan chocolates and it’s not really that hard. Making your own may take a little effort from you, but you can purchase it from vegan store too. You do not have to be in a small circle about what is necessary to make a true vegan cake or how to go about preparing it. Here is a list of ingredients you will require and the specific equipment to help you make your vegan cake. It is worthwhile to add that some ingredients are optional, and there exist some replacements to use if you cannot get a particular item at any time. Since the nature of the ingredients does not differ widely, you can use them in the manner you should use their substitutes. Where this is not the case, I have provided additional steps on how to use them in the step by step process that I have outlined in the subsequent paragraphs. Referring to equipment, some options also exist from what to use as a whisker to the kind of mixer to employ. Depending on the size of the cake you are preparing, there are mechanized alternatives you can find in your local household equipment or kitchen appliances shop. Many options are in the market, and you can decide on your preferences to get the best results. There are no specific brands that I have recommended in this article as the technology and processes are quite simple to follow and understand. If you have used gas, electrical or even the local oven before, then you are likely to be acquainted with how to set the temperature, regulate the heat and set it to cool off. Switch on the oven and make sure it is heated up to 350°F to have the desired temperature that will get the cake baked and eliminating any cake falls from unstable temperature. This means allowing the oven settle at this range for up to 15 minutes. The sifting stage is crucial, and it means sifting together the salt, flour and baking powder. Sifting the powder is of particular importance so that the other ingredients you are mixing with it can form a ready whole and homogenous nature. When powder sits in storage, it can get lumpy. A baking spray is recommended, so you should rub it on the sides and bottoms of your cake pan. Allow this get to the sides and corners. Use flour on the bottom and sides of the pan by placing a bit of scoop for use. Shake and tap so that the sides and the bottom of the pan can be getting coated with flour with the excess dropping off. When you cream both the margarine and sugar together until they become light and fluffy, it makes it easy for there to be fine bubbles to capture gasses released. You want to remain on this step for about 5 minutes using a medium spread. This will help the texture of your cake as it will become finer and lighter. The Vegan Egg Replacer is Powdery in nature, and you can use this effectively in place of eggs to make your cake dense. 1 ½ teaspoon effectively replaces one egg, and you need to add water in three tablespoons measures. Use a fork to whisk this into the slurry you desire. Your sifted ingredients are next here, and you need to add them into the mixer at low speed. You must continue with mixing until they are well incorporated into the entire mix. This ensures that the ingredients get evenly distributed and when using a heavier mix, an electric hand mixer can be of help. At this stage, you can alternate the liquids addition along with the other dry ingredients to aid the absorption of the almond milk without over mixing the batter. Gently add the milk while the mixer is on low drive till it combines wholly. The flour needs to even out, and this can be achieved by stirring with the spatula. This will eliminate the flour remains until the mix is looking inch perfect with no particles sticking out or uneven. This is a necessary step you need to take note of to get your desired mound. In dividing the batter between the cake pans, you need to scoop with a scale so that the batter can be even on both pans. The top needs to be smoothened with a spatula to the desired shape. The pans need to be dropped against the counter at this stage to eliminate the air bubbles. You need to set the baking time for about 30 minutes and stuff it into the oven. When the timer comes off, the cake should be puffed and golden with the sides pulled away from the pan. If you stick in a toothpick, it should come out clean. Allow the cake to cool for up to 15 minutes while remaining in the pan. Use an offset spatula around the sides of the cake to release the cake from the pan completely. Flip the cake out of the pan, detach the parchment lining and make sure the right-side is flipped up so that it can completely cool. Once this is done, use your non-dairy frosting on the cake and assemble it with margarine cream. You can torch your frosting to make it more appealing and give it a little smoky flavor. 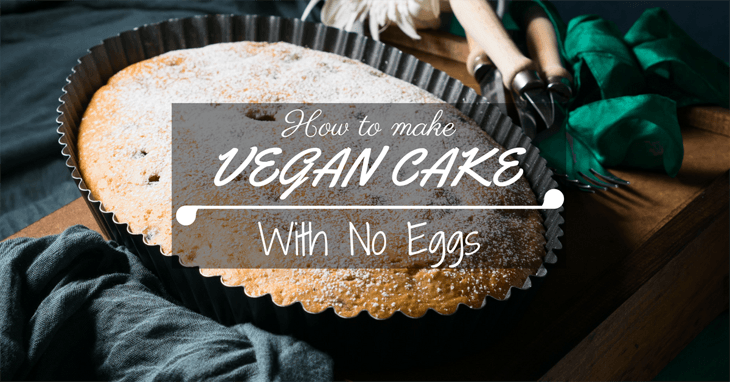 Knowing what to do to have your vegan cake prepared with an excellent outcome is important. If you follow the step by step process I have outlined here, I have no doubt that you will not only enjoy a good reading but also find it easy to follow. If this has been the case, then I am glad you can replicate what I outlined here to enable you to learn how to make a vegan cake with no eggs. Sticking to a wholly recommended vegan recipe is the only way to accomplish your vegan goals, and this is the reason I am keen to publicize this recipe. I encourage you to make your observations and comments available using the feedback box at the bottom of this page. You can share this article with friends and help them master the process of making a vegan cake for the delight of their family or loved ones.